Gardendale-Residential Subdivision, Hwy. 120/Howell St., Duluth, Gwinnett County. 6.0 acres, (55) townhome lots, developed with D.R. Horton. Scheduled for early 2019 start up. Governors Quarters-Residential Subdivision, West 15th St., Hinesville, Ga., suburb of Savannah, Chatham County . Just outside gates of Fort Stewart Army Base. (24) single family detached lots with (8) more lots being developed now. Sold to Wade Jurney Homes. Highland Overlook-Residential subdivision, Camp Highland Rd., Smyrna, Cobb County. 7.75 acres, (68) townhome lots, developed with Meritage Homes. Scheduled for early 2019 start up. Stonecreek-Residential subdivision, Highway 81, Loganville, Gwinnett County. 48 acres, (128)single family detached lots, developed with AMH Homes. Scheduled for 2018 start up. Ashley Falls-Residential subdivision, Wade Orr Rd., Buford, Gwinnett County. 18.12 acres (32) single family detached lots, developed with Century Communities. The Holbrook - Mixed Use Retail / Assisted Living - Former Heather Pines mobile home park, Highway 20, Sugar Hill, 6.33 acres, acquired and sold to City of Sugar Hill for development of a $65,000,000, 4 story retail and assisted living facility with Soloman Development Group/ Trinity Senior Living Group. Scheduled for 2019 start-up. Perimeter Park - Residential subdivision, North Peachtree Rd., Chamblee. 2.6 acres, 30 town home lots, under development with Beazer Homes. Hadley Township Subdivision – Residential subdivision, Peachtree Industrial Blvd., Sugar Hill. 25.050 acres, (55) single family detached lots, (117) attached town home lots, developed with Beazer Homes. Carramore Subdivision-Residential subdivision, Drew Road, Forsyth County, (19) single family detached lots, developed with KM Homes. Roswell Village-Residential subdivision, Chattahoochee Street, Roswell, Fulton County, 16 Townhome lots, developed with Acadia Homes. Peachtree Preserve-Residential subdivision, Bush Road, Peachtree Corners, Gwinnett County 16 lots, developed with Reliance Development Company. 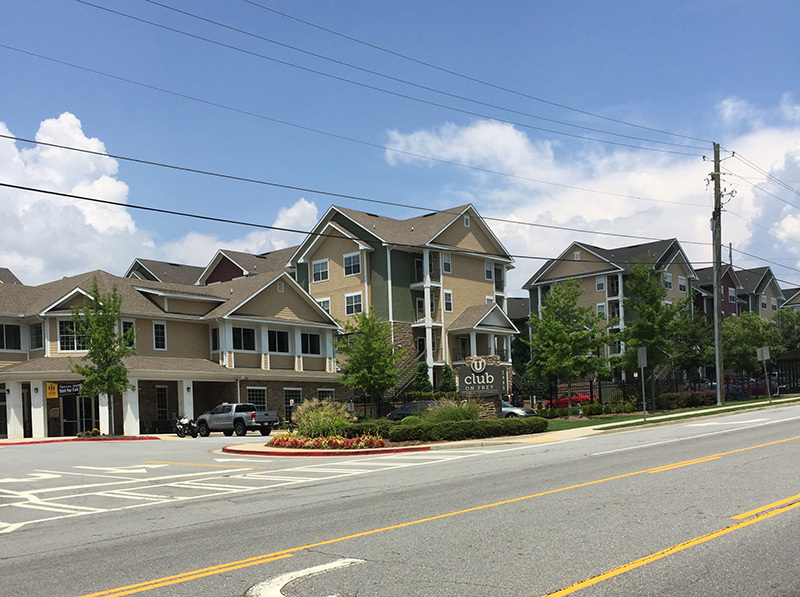 U Club on Frey - Phase II- Frey Road at Shiloh Road, Kennesaw, Cobb County, 6.317 acre tract purchased from Towne View Baptist Church, rezoned for student housing for 432 beds/140 units by Prime Interest, Inc., developed with American Campus Communities. U Club on Frey- Frey Road at Shiloh Road, Kennesaw, Cobb County, 6.517 tract acquired from Towne View Baptist Church, de-annexed from Cobb County and rezoned in City of Kennesaw for student housing for 500 beds/170 units by Prime Interest, Inc., developed with American Campus Communities, fully leased. Kennesaw State University is within walking distance (1/3 mile) from the property. Campbellton Road-Atlanta, Fulton County, Commercial property, 4.199 acres acquired from Atlanta YWCA, re-sold to developer for daycare and convenience store development. Walden at Oakwood-(35) acre apartment/commercial property tract, re-zoned for 300 apartment units and six commercial lots in Oakwood, Hall County, by Prime Interest, Inc.. Apartments developed with Walden Communites. Daly's Truck Driving School-5.9823 acres, Peachtree Industrial Blvd., Buford, Gwinnett County, acquired by Prime Interest, Inc. from the The Day Foundation. Prime Interest developed property in conjunction with building partner Metal Building Associates into truck driving school. Madison Subdivision-Post Road, Forsyth County, 90 lots, developed in conjunction with Landstar Corporation. Kelly Crossing Subdivision- Kelly Mill Road, Forsyth County, raw land acquired by Prime Interest Inc. and resold to Donnie Chapman/Capital Design Corp. for development into (30) residential lots. Brookside Subdivision-Hyde Road, Forsyth County, 77 lots, developed in conjunction with Landstar Corporation. La Petite Daycare- Highway 20, City of Buford, Gwinnett County, acquisition/subsequent development of attached lot, sold for dentist office development, daycare re-sold for flooring company. Puckett Creek Subdivision - Residential Subdivision, rezoned from Agricultural to R2, City of Canton, Cherokee County, adjacent to Levitt and Son's Laurel Canyon project, 199 lots, developed in conjunction with Capital Communities, L.L.C. Rose Creek Phase III - Residential Subdivision, Forsyth County, purchased and rezoned by Prime Interest, Inc. from Agricultural to Res 3, 71 lots. Sold to Breedlove Industries. Carriage Park Subdivision - Residential Subdivision, ( 40 ) Lots, Rezoned from Agricultural to RES-3. Forsyth County, developed in conjunction with Cauley-Stevens, L.L.C. Carriage Post Subdivision - Residential Subdivision ( 21 ) Lots, Rezoned from Agricultural to RES-3, Forsyth County, developed in conjunction with Cauley-Stevens, L.L.C. Regency Park Subdivision - Residential Subdivision, ( 48 ) one acre lots - Rezoned from Agricultural to R-100, Barrow County, sold all ( 48 ) lots one closing. Developed through Prime Interest Properties, Inc.
South Lee Street- Commercial land, 5.88 acres, Rezoned from Agricultural to C-2, City of Buford, Gwinnett County, developed into Office Site, Retail / Strip Centers and Office / Warehousing. Morgan's Crossing Subdivision - Residential Subdivision, ( 31 ) Lots - Rezoned from Agricultural to R-100, by Prime Interest, Inc. Gwinnett County, sold all (31) lots one closing. Highway 124 @ Hamilton Mill, Commercial development, 8.14 acres, Professional Offices. Rezoned from Agricultural to C-1, Gwinnett County, sold 8.14 acres and adjoining 5 acres one closing through Prime Interest Properties, Inc.
Wheeler Road- Residential Lots, 7.5 acres, separated into estate lots by exemption plat, Gwinnett County. Thunder Road- Industrial lot, Rezoned C-2, City of Buford, Gwinnett County, 1.25 acres, sold for Sod and Landscaping Company. Old Hog Mountain Road - Estate Lots, ( 4 ) - .75 acre lots, ( 2 ) - 1.5 acre lots, separated into Estate Lots by Exemption Plat, Gwinnett County. Hamilton Springs Subdivision- Residential Subdivision, ( 50 ) Lots, Rezoned Agricultural to R-100, Gwinnett County. Developed thorough Subdivision Developer's, Inc.
Highway 324- 7.5 acres next to Mall of Georgia, Buford, Gwinnett County, Estate Lots by Exemption plat, sold as commercial after Mall of Georgia construction started. Indian Hills Subdivision- Residential Subdivision, ( 45 ) Lots, Rezoned Agricultural to R-100, Gwinnett County. Developed thorough Subdivision Developer's, Inc.
Harbin's Station Subdivision- Residential Subdivision, Rezoned Agricultural to R-100, ( 42 ) Lots, Gwinnett County, sold ( 42 ) Lots one closing. Developed through Subdivision Developer's, Inc.
Muirfield Subdivision- Residential Subdivision, ( 25 ) Lots, Rezoned Agricultural to R-100, Gwinnett County, sold all ( 25 ) Lots one closing. Developed through Subdivision Developer's, Inc.
Stonebrooke Subdivision - Residential Subdivision, ( 20 ) Lots, Rezoned Agricultural to R-100, Gwinnett County. Stonemont Subdivision - Residential Subdivision, ( 13 ) Lots, Rezoned Agricultural to R-100, Barrow County. These are some of the properties acquired and developed by Prime Interest, Inc., Subdivision Developer's, Inc., Homes Etc., Inc., and Prime Interest Properties, Inc., all controlled or formerly controlled by Marty Orr. © Copyright 2019 Prime Interest. All Rights Reserved.